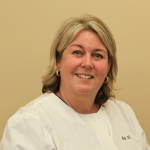 Beth has over 20 years of experience in the dental field. She obtained	her Dental Hygiene degree in 2007 from Allegany College, where she served	as the President of the Student American Dental Hygienist Association. Beth was the Director of the Dental Assisting Program at Hagerstown Business	College prior to coming to our office. She enjoys seeing patients both	new and familiar with the area.